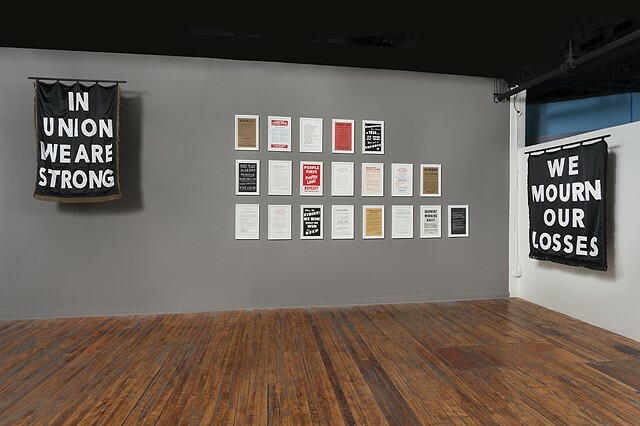 The exhibition presented silk screened and risograph prints, cloth banners, and a neon sign inspired by historical demands of the American labor movement from approximately 1890 to the present. The works are inspired by banners, slogans, broadsheets, flyers, posters, placards, and advertising created by the International Ladies Garment Workers Union (ILGWU)  historically the largest and most important union representing workers in the womens apparel industry in North America. Material research was conducted at the ILGWU labor archives at Cornell University, in June 2015. New Demands? surveys a history of demands for better working conditions in the garment industry, the winning of rights and benefits by members of the ILGWU, and the eventual demise of the entire American textile industry. Presented together, the works that comprise the exhibition explore the substantial loss of an important American industry, but also, the recent shift to increasingly non-unionized, contract, low-waged, and precarious types of employment for a majority of American workers today. In so doing, New Demands? connects the current crisis in timed labor to historical struggles for workers rights. Presented as part of the Spudnik Press Residency Program. Thanks to Spudnik Press and especially Angee Lennard, Nicolette Ross, and Yewon Kwon; Patrizia Sione, Research archivist at the ILGWU Archives, Kheel Center for Labor Management Documentation & Archives at Cornell University; SAIC Faculty Enrichment Grants; and Christine Tarkowski.